For most kitchen cutlery applications a 5k stone gives a high performing and versatile edge. This Naniwa Professional (formally known as the Chosera) 5k produces not only excellent edges, but does so with the ease and satisfaction for which Naniwa Chosera stones are known. Chosera stones produce precise edges thanks to their firm nature and slow dishing. They cut quickly decreasing fatigue and helping sharpeners to maintain good form. Choseras do all this with great feel and the ease of splash and go use. Extended soaking is not recommended. 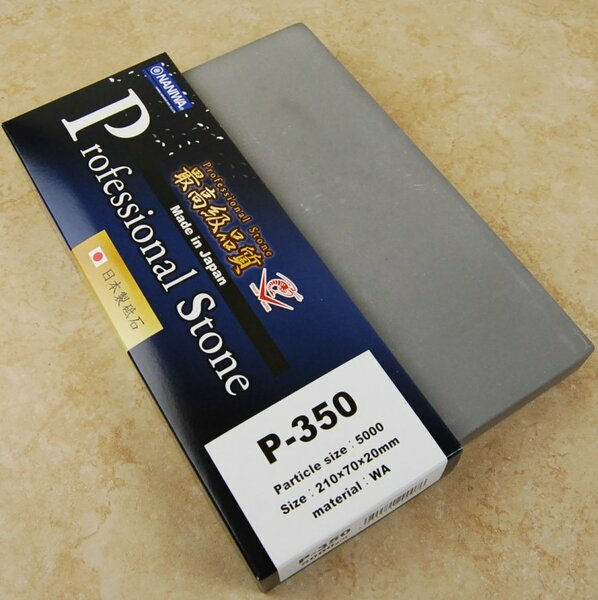 The 5k stones measures 210mm x 70mm x 20mm. i got different man made watertstones, shapton glass stones, naniwa ss, Norton, but so far this stone is the best stone I ever had. It is hard, and the finish it leaves it so shiny, almost like a mirror. It is like a Coticule, but way cheaper and it gives a better finish. I;d buy it again!! Let me just say upfront that this is a great stone. Great feedback, slow wearing. The finish the stone leaves is, by itself, almost mirrored. When used with it's sister, the 10k, the edge is out of this world.